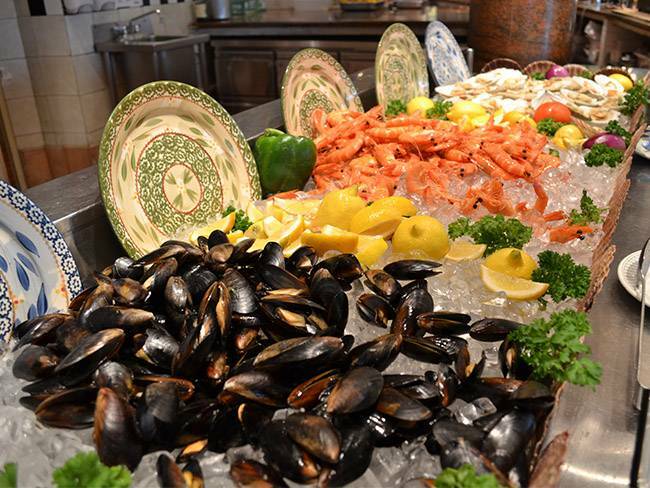 Looking for an excellent cheap Halal buffet in Singapore? You will be pleased to know that you can try out Muslim-friendly food places in Singapore with delicious varieties of international and local flavours – without breaking your bank of course. Singapore is one of the best places for foodies on a budget who want to experience diverse cuisines. 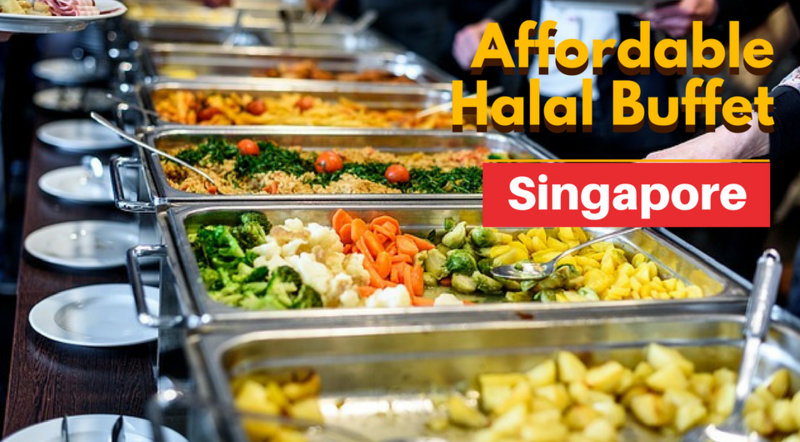 After a day out with your friends or family, drop into any of the Halal buffet restaurants in Singapore listed below for good food at affordable prices. Flame Café is where you will get your money’s worth when you try out their daily Pagoda Steamboat Buffet. You can enjoy a variety of delicacies from Flame Café, and choose from their buffet options which are Supreme, Deluxe and Premium. The Deluxe option is ideal for someone on a budget, where you can take your pick of meat and vegetable from the self-service counter. Some popular items include Char Siew Chicken, Sliced Beef and Sea Urchin Fishball. If you enjoy a variety of seafood and street food, Penang St Buffet should be your next stop when you are looking for Halal food in Singapore. Whether it’s live oysters, fresh mussels or nasi lemak, you can taste some delicious local flavours and seafood at an affordable price. Do check out other favourites such as rojak and kueh pie tee too – and don’t miss their special durian cendol either. 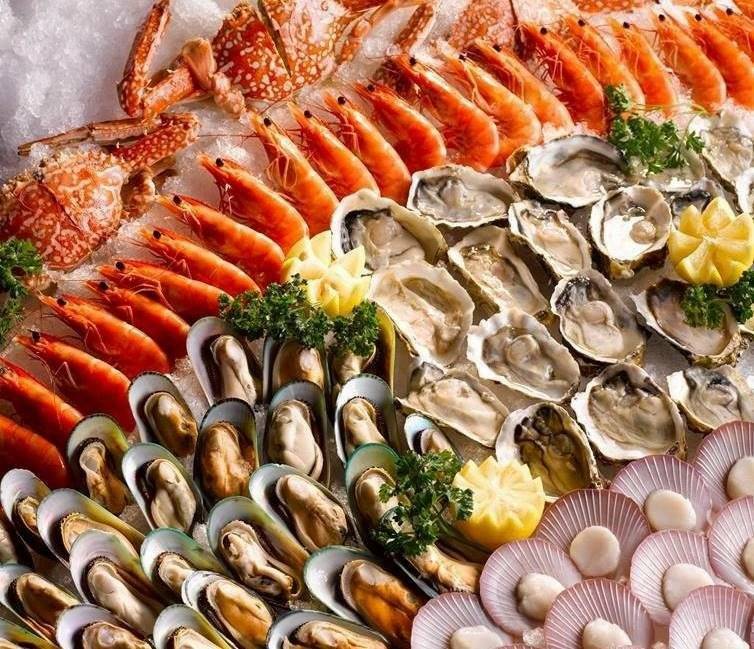 Penang St Buffet also has a seasonal All You Can Eat Crab Buffet with delectable crab dishes such as Salt Egg Crab, Pepper Crab, Tom Yam Crab and so much more. Rhombus Pizza is one of the unique Muslim-friendly food places in Singapore where you get to make your very own mini pizza at your table. Take your pick from sweet or savoury options such as pepperoni, shrimp or sprinkles and chocolate – there is plenty of cheese to go around too. You can also enjoy free-flow drinks, soup and spaghetti. However, you will need to call in before dropping by, as they only take reservations at the moment. Seoul Garden is the best place to go for an all-you-can-eat buffet complete with delicious Korean marinated meat, seafood, sushi, desserts and more. They also have some delicious sauces to try out. 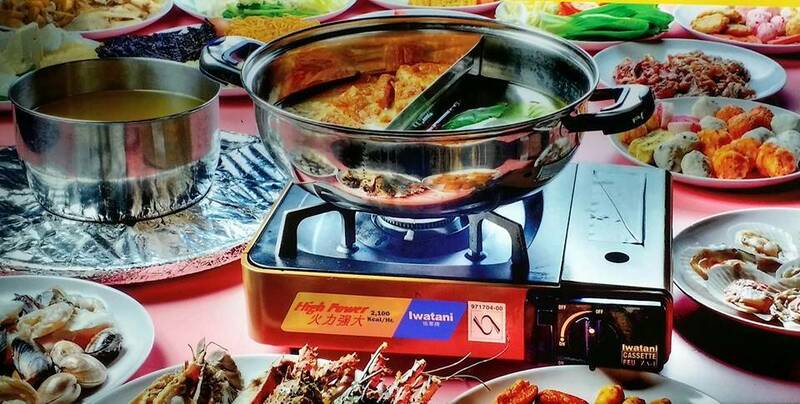 You can cook your own meals at the table, which will have its own grill and steamboat. They have nine outlets across Singapore including in Bugis Junction, Tampines Mall and Jurong Point too. Located at Satay by the Bay, this is an ideal spot to for food that won’t break your bank when dining out with a crowd. 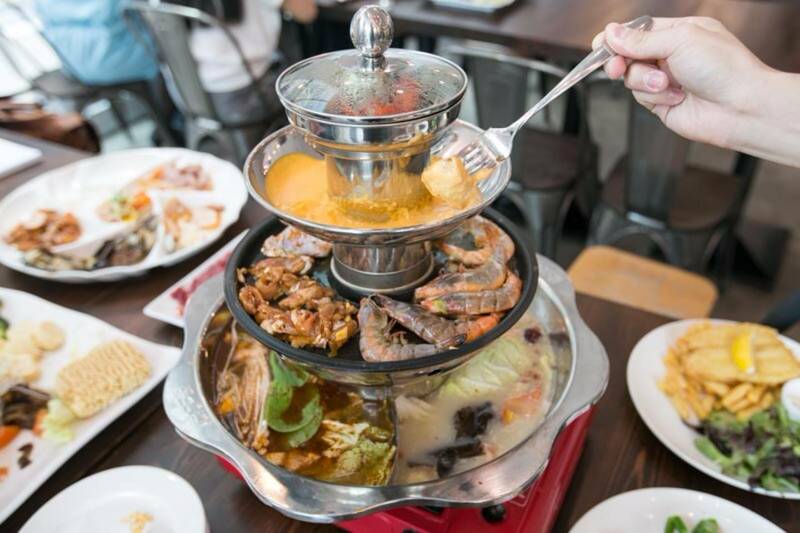 This is one of the best Halal buffet restaurants in Singapore to visit if you love seafood, and this Halal buffet has excellent selections of meat complete with hotpot and grilling at the tables. They also offer complimentary ice cream and the drinks are free-flowing too – definitely worth the price. Sakura International Buffet is one of the best places for Halal food in Singapore that has an impressive selection of Japanese, Western and Asian cuisines. Look out for sashimi, teppanyaki and their Hiroshima Oyster Omelette – there are a few DIY stations as well. Don’t forget to try out their dim sum and the seafood either – this is another great spot for those who are dining out in a large group. Sakura International has five outlets across Singapore that includes Clementi Woods Park and Downtown East. Kublai Khan is among the Halal buffet restaurants in Singapore that has an awesome range of dishes from different cuisines. However, the Mongolian BBQ selection has remained a favourite – customers can select meats and get their meal freshly prepared by the chef. The buffet has plenty of Chinese dishes too. 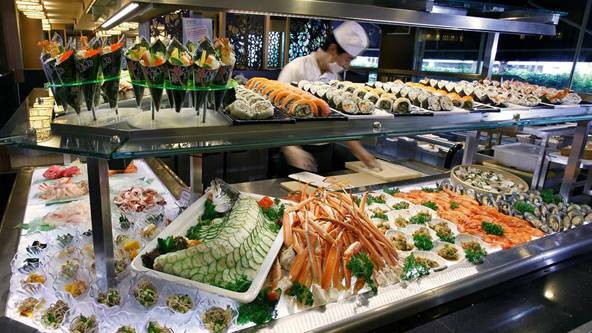 You can even get some delicious sushi, sashimi and other seafood delights choose from a good dessert selection. If budget is not a concern, then the Asian Market Cafe, Located at Level 2 of the Fairmont Singapore, would be a great choice for dinner. They provide a large buffet spread of both International Asian cuisine and local favourites such as Japanese, Chinese, Malay, Indian and more. Time to get digging! Asian Market Cafe was officially launched as a Halal certified restaurant in 2010. Have a closer look at their Halal friendly services with through our interview with Fairmont Singapore during their opening. P.S There’s also separate prayer rooms right outside Asian Market Cafe. These are frequently used by the restaurant patrons as well as shoppers at the adjacent Raffles City mall. Don’t forget to use the HalalTrip app to easily find Halal food places near you in Singapore or to locate Halal restaurants on your mobile.